There’s a 2,000-year-old archaeological mystery preserved in Southern Peru: enormous images carved into the desert by unknown ancient artists. 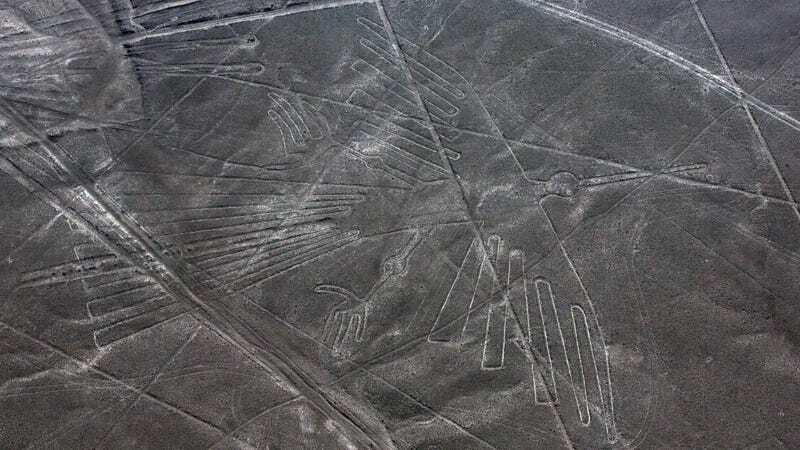 The beautiful Nazca Lines depict birds, monkeys, and humans, and some of the creations span up to 1,200 feet. And a man just drove over them with his truck. Jainer Jesus Flores Vigo, 40, was arrested after he allegedly ignored warning signage and drove over UNESCO World Heritage site, the ministry said. Argentine newspaper Clarín reports that the driver said he didn’t know the area because he had never traveled there before and that he left the road because of a mechanical problem. The newspaper speculated that the driver actually drove off the Pan-American Highway to avoid paying a toll. Artists from pre-Hispanic Peruvian societies between 500BC and 500AD created the massive drawings by removing the top layer of darker rock to reveal the lighter earth below, according to UNESCO. The dry desert environment has allowed the markings to remain for 2,000 years. This isn’t the first time stupidity has led to someone damaging the lines. Greenpeace performed a stunt back in 2014 in which they laid large pieces of yellow cloth on the lines. I ignore Greenpeace canvassers on the street to this day, for this reason. If you find yourself in Southern Peru, stay on the road. Please. Who created these huge, mysterious wheel patterns in the Mideast thousands of years ago?